Apologies for the delay, we have been informed that the fix has passed internal testing and should be available in the App Store shortly. No specific ETA because it's now dependent on Apple's approval process, but likely to be by early next week. Thanks so much for your patience! Kind of a good news. It has been taken too long for us iPhone users. We have reported this issue many times.Hope get fix this time. Thanks again for Facer’s help. any prediction of when it will be available, on the stor ? @rod14es the update that will fix this issue is NOT in the Facer app unfortunately, but in Google's WearOS app, and we therefore have no control over its deployment. As you can imagine, Google's updates go through significant internal testing, and likely extra testing/oversight by Apple because Google is such a larger partner of theirs. This is probably why this is taking so long. We wish we could speed things up, or even provide some kind of ETA, but it's unfortunately out of our hands. Last week you guys wass waited for the beginning of this. and now ? So whens it gonna be fixed? Give an answer facer.... your potential customers demand it. You should actually be asking Google, since it's an update we're waiting on from their side. Just updated google and Facer is now working ! 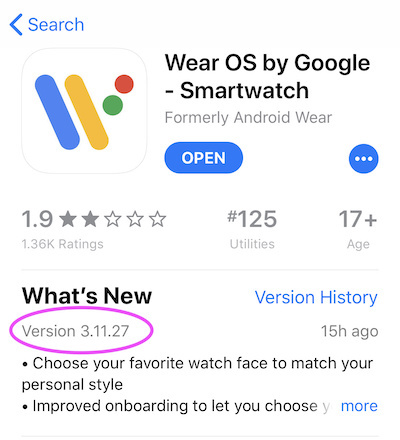 Still got 3.7.27 version of Wear OS in China App Store. Due to some kind of reason the Wear OS app is an Chinease Sepcial Edition for Chinease users. Do you hava a ETA for the version 3.11.27 for us Chinease users? Hi @forkiofficial! Can you send us an email at facer-support@little-labs.com? We'll investigate this with you. Updating WearOS was confirmed to fix the issue by our team and by a number of users in the community. You may be experiencing a different problem.